What goes through the mind of an astronomer specialized in the search for extraterrestrial intelligence when he encounters one of OUBEYs paintings for the first time? 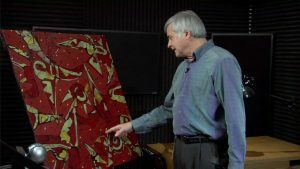 “Krypto” was the title OUBEY gave to the painting which travelled to Mountain View California in April this year to meet Dr. Seth Shostak, Chief Astronomer at the SETI Institute. The video recording of the encounter marks the first in a new series of Encounter OUBEY-Videos. Click here to view it. Every three months another new Encounter Video will be posted online atoubey.com/journey.